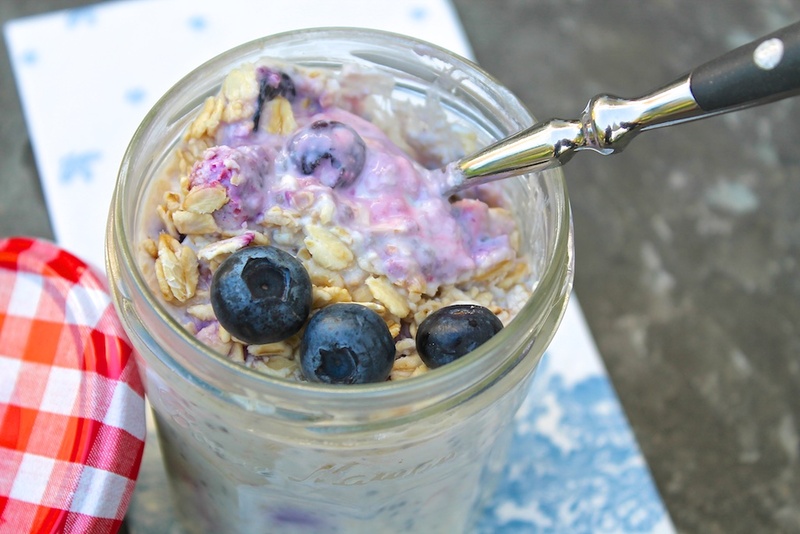 This classic recipe for no-cook overnight oats offers meal prep convenience and is loaded with fruit, fiber, and protein-packed staying power! Overnight oats have a lot going for them. The no-cook, prep-ahead recipe makes the morning routine a breeze with its winning combination of protein, calcium, fiber, and Omega-3s. And it tastes great! In fact, I enjoy this easy breakfast-in-a jar so much that I’ve created many seasonal versions. The following recipe is my original, however, and I find myself returning to it every fall. Fresh berries and juicy peaches are a mainstay of our summer breakfasts, and I’m always a little sad when their season comes to an end. But frozen fruit can ease the transition, and it works surprisingly well in these grab-and-go cups. Because they maintain their plump sweetness, frozen blueberries are my favorite. Unlike their perishable counterparts, the quality of frozen blueberries is consistently good, as they’re frozen at the peak of ripeness. You can keep a stash of them on hand and transfer the berries directly to the oat cups. No thawing, washing, or chopping is needed. Now, I know what some of you may be thinking. Uncooked oats? Eat them cold? And you’re right. It sounds strange—until you try. Think of this as a cold, fruity porridge–refreshing and filling at the same time. After an overnight soak, the oats become creamy. I like the texture to be fairly thick with the slightest bit of soupiness. The first time around, I suggest following the recipe. Then, if you prefer your oatmeal cup a bit thicker or thinner, simply add or subtract a tablespoon of milk or a teaspoon or two of oats until you have the perfect consistency for you. The recipe is quite flexible, so feel free to experiment further. For example, almond extract is a nice option to the vanilla. It delivers a bigger flavor punch, so when using, you may wish to start with just 1/4 teaspoon. With regard to sweetness, I like two teaspoons of pure maple syrup, but feel free to adjust to your taste buds. If you like a little crunch, toss in some toasted nuts or granola before digging in. Chopped banana is another welcome addition. Reheating is an option but not necessary (I never do). However you mix your personal-size oatmeal cup, I am willing to bet that if you eat one for a few days in a row and find the combination that suits you best, you will find yourself looking forward to these–maybe even craving them. I’m always happy to quickly mix a few jars in the evening and have breakfast ready and waiting! When fresh berries or peaches aren’t in season, frozen blueberries work especially well. I made this version in 2013 as a part of a strawberry feature in the June issue of Susquehanna Style. A big appeal of these healthy cups (beyond the convenience and great taste, of course! ), is the versatility. A 12-ounce jelly or Mason jar is an ideal size for this healthy, make-ahead meal. Put the lid on and store in your refrigerator for up to three days for a speedy yet satisfying breakfast. Frozen fruit is a surprisingly delicious option and allows you to whip up these single-serve cups any time of year. Add oats, yogurt, milk, chia seeds, vanilla or almond extract, and maple syrup to the jar. Screw the lid on tightly and shake well. Stir in the fruit and mix to distribute throughout the jar. Sprinkle an extra teaspoon of oats (I like a slightly rounded teaspoon) over the top and do not stir. Replace the lid and store in the refrigerator for up to three days. In the morning, stir and enjoy straight from the jar. While I do vary the fruit, my personal favorite when using frozen fruit is blueberries, and I often add half of a chopped banana in the morning. Strawberries, mango, raspberries, and peaches are also delicious. I keep bags of frozen, organic fruit on hand and add while still frozen. For the larger pieces of fruit, chop before adding. The fruit can be cut fairly easily while still frozen. In the morning, feel free to also add other traditional oatmeal toppings, from toasted almonds to shredded coconut. I hope you love this breakfast as much as I do, Terra! Thanks for the comment! Pineapple would be delicious, Dorothy! Enjoy!! How did it come out Dorothy… I’m really not a breakfast person sad to say I enjoy tons of fresh fruit and vegetables..but I wanted to try something new for breakfast instead of smoothies. If you like smoothies, Lynette, my guess is that you will enjoy these. They have many of the same ingredients, can be customized based on preference…just better to eat with a spoon than a straw! you could actually dump the whole jar into your blender and add some juice and make it your smoothie. It would cut down on the morning prep. Just a thought. Thanks for the idea, Gail! I make these and never heat them, you just eat it as is, cold yummy goodness. heating it would destroy and kill the good bacteria in the yogurt. I don’t heat the cups either. When I mentioned heating, I was referring to the basic combination of oats and milk or water. A simple two-to-one ratio of liquid to oats soaked overnight works for a speedy breakfast. When made that way, I prefer it warm: ) Hope that makes sense! Ann, I had difficulty locating chia seeds. You suggested trying an extra tablespoon of oats or decreasing the milk by 2 tablespoons. I gave it a try the other day and added 1 extra tablespoon of oats. I even added 1 tsp. of wheat germ for a little extra nutrition(as if this isn’t healthy enough!). It was delicious, and just the right consistency. Thanks for the advice. I’ll be making more of these! I found chai seeds super cheap (2.99 for a decent sized bag) in the food section at Ross. People don’t know the treasures at stores like that. Ross, TJMaxx, Marshals, and the like often have great dry goods! I also buy my Himalayan pink salt there. $3 for a giant shaker! Such great tips, Rachel. Thank you! I’ve had this yummy, healthy, filling dish for breakfast every day since I first saw the recipe. I’m with Ann – blueberries are the best. In my freezer I have a few bananas that got too ripe & have placed a frozen one on top of the cereal mix at night. The next morning before eating the banana is soft and easily stirs in – that’s pretty good too. And what about flavored yogurt? Tried it, like the Greek plain best but the lemon was not bad, not bad at all. And I use Vanilla Silk soy milk – seriously, the variations can be unlimited. I got the chia seeds at the Giant in their natural food section. Thanks so much for your great comments, Barbara! I love the frozen banana idea and agree with you completely…the variations are endless! Love this recipe. We use frozen mixed berries and it is amazing. You can vary the type of yogurt and milk as well. My family hasn’t met a variation they didn’t like. It works well as a grab and go breakfast for hubby and kids on school days. Ann, another winning recipe. I put this aside for awhile and just recently picked it up again. This is a regular morning breakfast for me now. I make two or three at a time and throw them in the fridge. Wonderful and nutritious! DELICIOUS and FILLING 🙂 Thanks for sharing. I love this meal! I am also new to canning and am wondering if that is possible with this receipe? If so, what would be the canning time? I’m so glad you like it, Diane! Given the ingredients, this would not be a great meal to preserve. You can, however, make them up to three days in advance and store in the refrigerator. Thank you Ann! Yes, I got to thinking about it afterwards and knew it couldn’t happen. I’m on my third day, soooo, I’ll be making more today with mixed berries and almond soy milk. Yummy! I make these often and they’re absolutely delicious! Thanks for commenting…so glad you like! Seriously in our weekly rotation now. We love this recipe! That’s great, Colleen! So glad it’s a hit! I’ve already made this twice this week. It LOOKS a little strange, but it is so good! And very filling for the calories, absolutely. Protein, fiber, fruit…..great idea. I made mine with frozen strawberries. Love your column! Thanks so much for taking the time to check in, Lauren. I’m so glad you’ve enjoyed these and appreciate the thoughtful comment! Hope it started your morning off on a good note! Do you know the nutritional content? I’m diabetic and the carb and sugar count are a big deal for me. Thank you. Hi Gerardo, This tool is a good one for those needing the nutritional breakdown of various recipes, and it allows you to adjust for the specific ingredients you use: https://www.caloriecount.com/cc/recipe_analysis.php. I love these oatmeal cups! I’m not a breakfast person but the chewy texture of the oats, the creamy yogurt and bursts of sweet fruit are awesome. I eat this cold from the fridge. Perfect summer breakfast or snack. Thanks for the great feedback, Donna. So happy you like them as much as we do! As long as the oats have softened to your liking, you’re good to go. My guess is you’d want to wait at least 3-4 hours…but let me know if you find otherwise! I have eaten oatmeal in the past, for all the right reasons. But honestly, I despise it. I tried this recipe following directions…but omitted almond or vanilla extract, used unflavored yogurt, soy eggnog, and frozen berry mix from Costco…and I LOVE IT!!! I would not believe it contains oatmeal had I not made it myself! Thank You for a wonderful alternative to my least favorite breakfast food!! An oatmeal game-changer…how awesome! Thanks for letting me know, Liz. I’m delighted that it was a surprise hit! I go organic all the way with the oatmeal and all the fruits–that would be strawberry, blueberry and mango. Four soup spoons of Stonyfield yogurt goes to the bottom. Then I add either milk or coconut milk. Then I add the fruit then finish it with a little more milk. Finally I add one soup spoon full of golden raisins and sprinkle some cinnamon on top. That’s it–put it in the fridge overnight and you have a wonderful, healthy breakfast. I think your fruit picks sound delicious and I love the addition of raisins, Fred. So glad these have become a welcome breakfast for you! Thank you for all the great recipes. I’ve seen these on tv and wondered how to prepare!!! God bless you!! I’m so glad you found the recipe, Barbara. Enjoy! Trying tonight…sounds like a healthy way to reduce my cholesterol and delicious too. Thanks for sharing. You’re welcome, Joyce. I hope you like it as much as I do! So I have the mason jars with no lids… can I use plastic wrap or aluminum foil??? Absolutely, Ana. I would use a piece of plastic wrap to cover the jar. And you could use a bowl instead — I’ve just gotten in the habit of using a jar! Thank you for the article, overnight oats is something that was brought to my attention, recently, and I’m interested in trying. Yours is the first article that showed up that wasn’t obviously a product advertisement. Again, thank you for that. First off, thank you for catching and mentioning my typo! I just corrected it. Also, I’m delighted that you found this recipe and hope you enjoy it as much as we do. Feel free to report back. The cooking time for steel cut oats is 30 min. Do you know if you Recipe will work with steel cut oats? The proportion of liquid to oats is different for steel cut and rolled oats, so the recipe doesn’t work with a direct substitution, Debe. You could experiment with a slightly smaller amount of oats although the texture will also be different. if i made like 5 would it still be good on the 5th day? I have a friend who makes five of these every Sunday night to eat throughout the week and she says they are still good on day five. If you store them in the coldest part of your fridge, they should be fine. I’ve kept them up to three days with very good results. Is there an option to go without yogurt at all? Hi Deanna, I’ve made several versions with no yogurt. In this recipe, you can play around with using all milk and more chia seeds, and/or you can substitute some mashed banana for added thickness and sweetness. 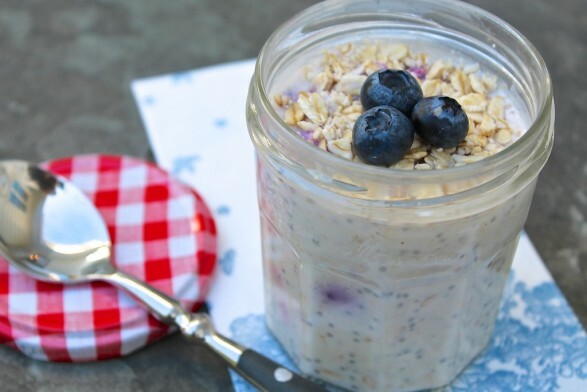 Also, here is a yogurt-free recipe that I really like: https://fountainavenuekitchen.com/bircher-muesli-jars/. Oats can be used in place of the muesli, but the muesli does add a little something extra. I love your recipe and I made up five jars every Sunday night for the week. I have been doing this for a month and I have lost 10 pounds, when I want something sweet a night I grab a jar and that takes away my craving. Thank you for sharing your recipe. That is such great news, Caroline! I’m delighted that you like the recipe and thrilled for your accomplishment. Way to go! Great work, Linda. Eight-five pounds is a huge accomplishment and I admire your perseverance. My sister in law has been making these for several months now. She does one with canned pumpkin with pumpkin spice and pecans. It’s delicious! Talk about healthy. I’m so happy these are a hit, Cheryl. A pumpkin version sounds especially good this time of year! So glad you found it, Linda! If you’re in a hurry, feel free to use another jar or bowl. Woo hoo! So glad this is a new favorite, Linda. Thanks for letting me know. Would this be fine if I just used water instead of milk? It will have a bit less flavor and creaminess, but I think it’s worth a try. You could always stir in an extra spoonful or two of yogurt if needed in the morning. I’d love to know how you make out! Do I need to sterilize the mason jars? No need to sterilize, Jean, since you aren’t canning and sealing the jars for storage. You could also use an empty jelly jar or container of similar size. Yay! So happy it’s a hit, Sarah! Does it have to be the old fashioned oats or will it work with the instant? 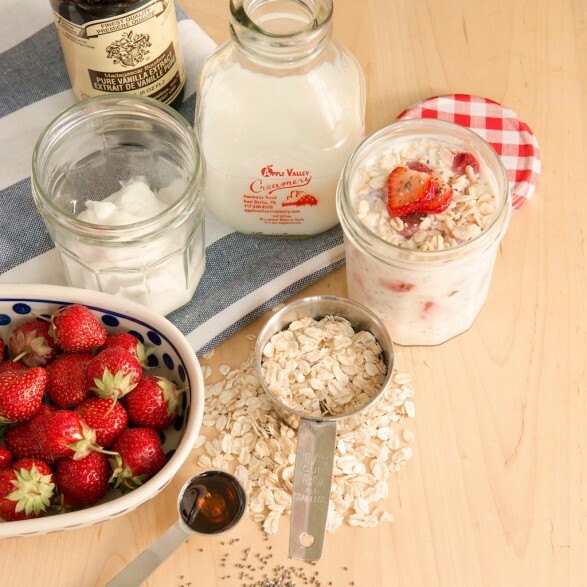 Old fashioned oats provide better texture in the overnight oats, Victoria. In a pinch, you could try the recipe with instant and see how you like. I just ate this for breakfast. First time making overnight oats. Instead of chia seeds I used small shredded coconut. I also only put a small bit(less than a teaspoon)of maple syrup in. I only have frozen strawberries and blackberrys so those went in. And vanilla essence not extract. Very yummy, quite similar to a smoothie in that it is cold and thick. I thought too that a 1/3 C of oats wasn’t very much but it filled me up. If you are making this for a bigger snack or have half now and half later, I would definitely up the measurements. Will definitely be making again and playing around with the ingredients. I’m so happy you enjoyed this and appreciate all your feedback. This recipe easily allows for customization, and I’m glad you were able to work so well with what you had on hand! Do you cook the oats first or do you just mix it right in the night before, and then eat it the next day. No cooking necessary. Just mix in the dry oats, let them sit overnight, and then enjoy in the morning! This looks incredible! I can’t wait to try it. Sadly i don’t like eating breakfast and i could eat this at lunch time but me and my co workers share foods so bringing this would be something. I want to ask if i can eat this for dinner? It’s a no-cook meal, Janet. The oats soften and absorb the liquid as they sit overnight and can be enjoyed cold in the morning! I love this recipe-I’m in my 80’s and choose to be independent as long as possible. I love eating breakfast and I am able to make this up late afternoon or early evening so when I get up in the morning, I can eat my breakfast and be set for a good day. I use fresh organic blueberries and mix at times with fresh raspberries or strawberries. I often at times change ingredients of chia seeds, crushed almonds and/or chopped walnuts.Thanks so much for a great heathy breakfast. Truly awesome! Your comment makes me so happy, Larry! I’m delighted you enjoy this recipe and love your independence, energy and ability to mix things up. My older son has just taken a liking to these, so I’ve been making quite a few lately, too! I love this recipe – I have tried so many of them and this is definitely my favorite – thank you! Great news, Margaret! I’m thrilled this combination is a new favorite and appreciate the feedback! I use peach yoghurt and almond extract with a finish of diced peaches. I love peaches, Diannia, and they pair so well with the flavor of almonds. Thanks for mentioning! I made this last night and it was wonderful! I made homemade yogurt in the instant pot as well as homemade vanilla essence! Carl, I bet it was extra special with your homemade yogurt! I’m thrilled you enjoyed and appreciate your comment.